First off we have A.P.C. (Atelier Production Creative), a French Company who specializes in minimalist style and modern cuts. Now for sizing, you should size down 1-3 sizes since all of the A.P.C. cuts are vanity sized. Style: New Standard. Cut: Slimming, but less tapered. Sizing: 1-3 Sizes Down. Style: New Cure. Cut: Slimming and tapered. Sizing: 1-2 Sizes Down. Style: Petit Standard. Cut: Super skinny (seriously skinny). Sizing: 1-2 Sizes Down. Where to buy Online ¬– APC.fr, Tobi, Yoox and Context Clothing. Brick and Mortar¬ – Various Designer Stores Worldwide. Price Range: Around $150 US. Nudie Jeans Co: A Swedish Company that provides a variety of styles and cuts. Sizing for Nudies are a uniform 1-2 sizes down for stretching for all styles. Style: High Kai. Cut: Super skinny and a higher waist. Style: Slim Jim. Cut: Strait and can be Slim, Tight, or Strait. Style: Thin Finn. Cut: Super Slim. Style: Grim Tim. Cut: Super Skinny. Where to buy Online ¬– NudieJeans.com, Tobi, Revolve Clothing, Context Clothing, and Yoox. Brick and Mortar – Various Designer Stores Worldwide. 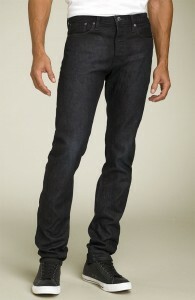 Cheap Monday: A Swedish company who offers affordable jeans that look great and fit great too. 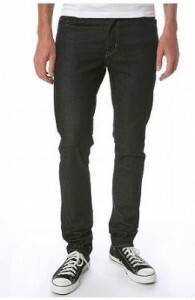 As the name implies, this brand offers skinny jeans at an affordable price. These jeans will stretch quite a bit, but the material will go back to the original size easily too. Sizing is uniformly 1 size down. 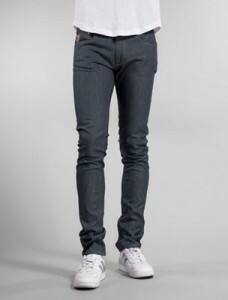 Almost all Styles are skinny with tapered legs. Where to buy Online ¬– Urban Outfitters, Yoox, Revolve Clothing, Karmaloop. Price Range: Around $60 US. Levis: American denim giant formed in 1853 with a diverse line of jeans and styles and is famous for using copper rivets to reinforce points of strain on the jeans. Sizing is 1-2 sizes down uniformly. Style: 511 Cut: Slimming and slightly tapered. Where to buy Online ¬– Urban Outfitters, Levis.com. Price Range: Around $50 US. Helmut Lang: Austrian clothing brand that is famous for their minimalist design and quality fabrics. Styles vary from season to season, but the Fit is skinny and tapered. Sizing is uniformly 1-3 sizes down. Where to buy Online ¬– Revolve Clothing, Nordstrom. Price Range: Around $100 US plus, depending on season. April 77: French clothing label that focuses on styles inspired by underground music and unisex cuts. Style: Joey. 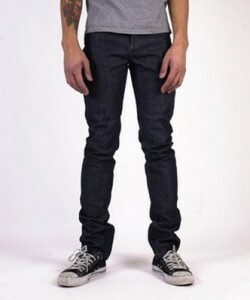 Cut: Skinny and tapered. Sizing: 1-2 sizes down. Where to buy Online ¬– Revolve Clothing, April77.fr, Yoox. Blank Denim: This is a women’s’ brand, but if you are skinny enough like me, you can easily wear these jeans in the unisex Cuts and Styles they offer. Sizing is uniformly 1-2 sizes down. Where to buy Online ¬– Karmaloop, Tobi. For more information on denim check out www.denimology.co.uk and the superfuture.com fourm. I would not be caught dead wearing skinny jeans. Nice article though. Fags in skinny jeans are disgrace to humanity. dude, I’m a guy and I wear skinnies. They freakin comfortable. Which cut of the Blank Denim would you suggest? I normaly have to wear jeans in w27 so i realy have problems to find men’s jeans in my size here in Germany. And i like the women cuts more, because they normaly fit me much better. My Grlfriend is saying that too.